Picturesque Golf Course Stunner Sits on 1st Hole Green! Exquisite 4BR Country Club Cabin is the PERFECT Crowd-Pleaser! Beauty abounds inside and outside of this attractive and updated Continental Country Club townhome. The centrally located dwelling will allow you to access all of what Flagstaff and the surrounding areas have to offer. It may be hard to leave the charming home. 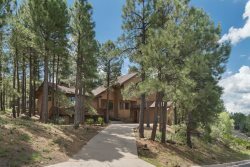 It is very tempting to sit out back and enjoy the stunning view of the golf course, along with the beautiful Ponderosa Pine Trees. This property with 3 bedrooms and 2.5 bathrooms has a warm and wonderful atmosphere and almost 1500 square feet of space, on two levels. The home will sleep and accommodate eight people comfortably. The Great Room has vaulted ceilings, a grand gas fireplace and a 48" flat screen television. There are large windows from the Great Room with plantation shutters that allow for great natural lighting. The entire home is nicely furnished and decorated. There are lovely hardwood floors/tile throughout a lot of the home. The beautiful kitchen is equipped with stainless steel appliances, granite counter tops and nice tile floors. The bright kitchen and dining room areas look out on to the golf course. Everything that you need including a microwave, coffee maker, crockpot and blender are provided. There are glass sliding doors that lead from the dining area out on to the golf course. The owners have created a peaceful and serene sanctuary for your enjoyment on the back, open, tiled deck. There is a table/chairs, patio heater, barbecue grill and lovely flowers (seasonally). There are also the majestic pine trees and of course the golf course itself. There is a half bath for Guests, that is located on the lower level. All three bedrooms are located on the second floor. The Master Bedroom is equipped with a king bed and a 42" flat screen television. The room also has glass sliding doors that lead out on to a small balcony, overlooking the golf course. The master bathroom is updated, with a very nice tiled shower. There are two other bedrooms upstairs. One has a queen bed and the other has a set of bunk beds, along with a futon that folds out into a full bed. In addition to the master bathroom, there is another full bath on the second level with a combination shower/tub for your convenience. All bedrooms are well decorated and furnished , as seen in the photos. The Continental Golf Club is the only public golf course in Flagstaff and can be utilized by all. There are endless things to do in this beautiful area. Enjoy the scenic hiking trails, Historic Route 66, along with wonderful restaurants and shopping in Downtown Flagstaff. Don’t forget that the Grand Canyon and Sedona are also nearby. Did I mention the Snowbowl ski slopes? Pets are considered, however we asked that you keep "4 on the floor" as we say in our house. Pets are not allowed on furniture or bedding. Also, please pick up after them outside. We usually allow one small to medium size dog. No vicious breeds. Feel free to contact us if you have any questions. We supply freshly cleaned linens, bedding, and towels for all our guests. We also supply paper towels, toilet paper, laundry detergent, dish, dishwasher, and hand soap. We do not supply shampoo, conditioner, or body wash. Although often times there will be a variety of condiments, coffee, etc., we cannot guarantee what will be available. Professionally managed by Kathryn Duncan, Owner/Designated Broker, at KD Prime Properties. Property Type: Townhome, approximately 1500 sq. ft. Parking: Garage - There is a 2 car garage with additional driveway parking available. Television: There are two large flat screen televisions. A 42" is located in the Master Bedroom and a 48" is located in the Great Room. Dining: There are 6 dining chairs and table. Kitchen: The kitchen is beautifully updated with Stainless Steel Appliances and Granite Counter-tops. Outside Deck / Patio: Back Deck includes a table and chairs and overlooks the Golf Course. Outdoor Grill: Barbecue Grill will be provided. Fireplace: There is a beautiful gas fireplace. Guests may utilize the Continental Country Club amenities. A guest fee will be assessed. Everything went as planned, and we were very pleased with the accommodations. We will be back. Our family enjoyed our stay very much. We have spent many getaways in Flagstaff and the Country Club area is our favorite. The townhome was perfect for our needs, very clean and the beds were extremely comfortable! Thank you! It was perfect for our needs. We only had interactions by email and it was courteous and professional. Kathy was very helpful and so nice to work with. Such a great place to stay! Very comfortable and so cozy!! Kathy was helpful and responsive to all of my questions! We thoroughly enjoyed our stay and will recommend your company to our friends and family! Kathy was great to work with, prompt with answering questions, and provided detailed information which allowed for easy check in and check out. The property was beautifuly decorated , clean, and very well stocked. The only thing we ended up needing was food. Everything else was provided. The beds were super comfy and the bedrooms were roomy. We felt very much at home. It was also nice to be able to park inside the garage to keep the snow off the car. We will certainly book this property again the next time we are in Flagstaff. We had a couple of questions and requests about this property. Kathy handled everything promptly and with extreme courtesy. Very professional. This was a beautiful condo. Large well-lit bedrooms, beautiful bathrooms, a cozy fireplace, a nice kitchen, and excellent views of the golf course and woods. It was covered in two feet of snow during our stay. The hill behind the house made for excellent sliding for the kids. There were two sleds at the condo. We had a blast! We never ran out of hot water and the beds were very comfortable. The third bedroom had a futon and 2 bunks. There were toys, coloring books, markers, crayons, legos, etc. Very kid-friendly. We all enjoyed our stay very much. The only team member that we worked with was Kathy and she was excellent. She was very responsive in helping us to book our reservation and also allowed us to check in a little early, which was helpful. Thank you Kathy. The property was fantastic. Very clean and provided everything we needed. It is very well decorated and very comfortable. The location is very quiet and provides a feeling of being away from town, while actually still being very close to everything including freeway access. Our family had a great time....just wish we could have stayed longer. Thank you!